NETWORK FINALS: SUNDAY NIGHT FOOTBALL adjusted to 8.1, down 0.6 from last week’s game, but still a high number for the season. In addition, football adjustments dropped 60 MINUTES half a point in final numbers, while ELEMENTARY didn’t have the NFL to blame for a 0.2 fall after NCIS: LA and MADAM SECRETARY remained unchanged. Local football overruns may also have hit FOX’s BREAKTHROUGH PRIZE, down 0.2. 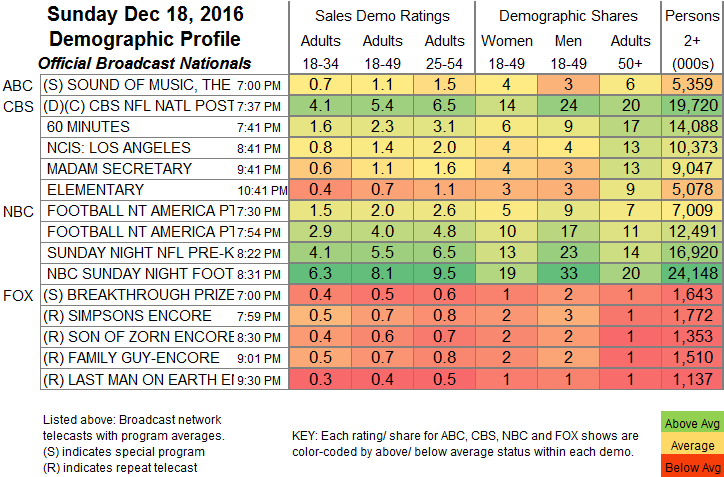 CABLE HIGHLIGHTS: Hallmark’s SLEIGH BELLS RING topped the scripted end of Sunday cable at 0.66. The season finale of Showtime’s newly-renewed SHAMELESS rose 0.02 to 0.62, and THE AFFAIR was up 0.03 to 0.22. TNT’s THE LIBRARIANS gained 0.04 to 0.48. On E!, THE ROYALS fell a tenth to 0.21, after lead-in MARIAH’S WORLD dropped 0.08 to 0.33, on a night that began with a special ROB & CHYNA at 0.44. The season finale of USA’s EYEWITNESS was up 0.05 to 0.20. 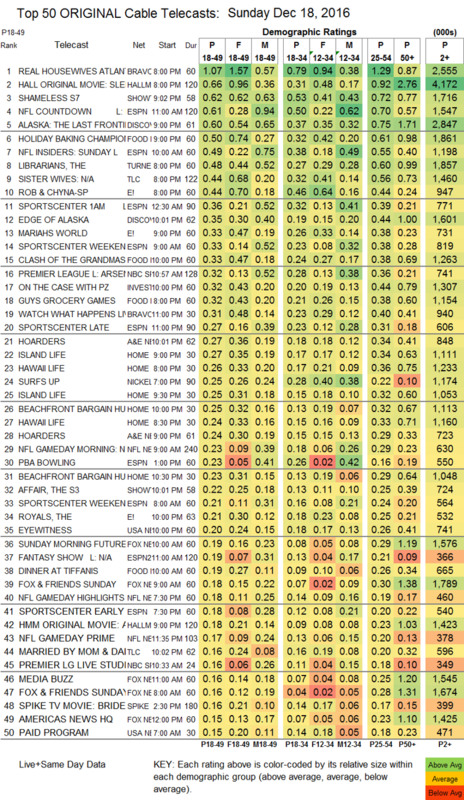 On the unscripted side, Bravo was dominant with REAL HOUSEWIVES OF ATLANTA, up 0.04 to 1.07. On Discovery, ALASKA: THE LAST FRONTIER rose 0.13 to 0.60, and EDGE OF ALASKA was up 0.04 to 0.35. Food Network’s HOLIDAY BAKING CHAMPIONSHIP dropped 0.06 to 0.50, CLASH OF THE GRANDMAS ticked down to 0.33, and GUY’S GROCERY GAMES fell 0.11 to 0.32. On TLC, SISTER WIVES was at 0.44 for a 2-hour episode, compared to 0.48/0.47 for the 2 hours that aired last week, and MARRIED BY MOM & DAD was down 0.05 to 0.16. A&E’s HOARDERS returned at 0.27/0.24.